A new truck scale that will dynamically weigh each axle and print a receipt with individual axle weights and the total without requiring a driver to stop has been introduced by Alliance Scale, Inc. of Canton, Massachusetts. The Alliance axleWEIGH In Motion Truck Scale weighs individual axles by simply driving over the scale at ~3 MPH and also calculates total vehicle weight regardless of truck length or configuration. 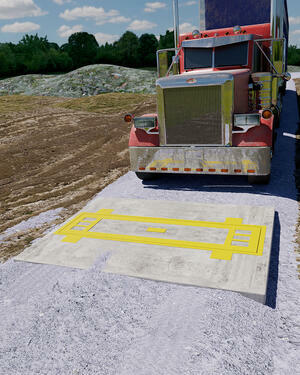 Easy to use, a driver stops at the controller, enters their known tare weight or truck I.D. to recall a stored tare weight in a single pass, or can use two-pass weighing and the controller will calculate the gross, tare, and net values. Featuring factory calibrated load cells and a preprogrammed indicator, the Alliance axleWEIGH In Motion Truck Scale yields better than ±0.5% repeat-ability on average. Preconfigured for easy installation, these dynamic weighing truck scales can be installed on a gravel driveway, eliminating the need for costly ramps. Suitable for a variety of applications, the controller can provide a CSV file with job numbers for every transaction. The Alliance axleWEIGH In Motion Truck Scale is priced from $19,995.00, depending upon configuration.